On Sunday, I presented a House citation to Jonathan Barry Hixson-Cooper at his Eagle Scout Court of Honor ceremony. A member of Troop 33 in Bath, he is the son of Melissa and Jen Hixson-Cooper and lives in Allen Township. 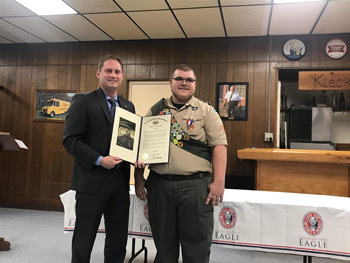 For his Eagle Scout project, Jonathan planned and coordinated the construction of a mulch play area and a wooden bench for the Walnutport Borough Park. Congratulations, Jonathan! As a free service to the community, I am co-hosting a shredding event with Sen. Pat Browne (R-Lehigh) on Saturday, Oct. 20, to give residents a chance to safeguard themselves against identity theft by having their personal documents securely destroyed. The event will be held from 10 a.m. to noon, at Robert “Bob” LaBold Maintenance Building, 550 W. Church St., Slatington. In an effort to provide the most up-to-date information to holders of small games of chance licenses, I will be hosting a Small Games of Chance and Liquor Law Regulations Seminar. The event will be held on Thursday, Oct. 25, from 6-9 p.m., at the Diamond Fire Company, 110 Main St., Walnutport. Doors will open at 5:30 p.m. Liquor Code Enforcement Officer Derrick DeVaney of the Bureau of Liquor Code Enforcement’s Allentown District Office will lead the presentation. Time will be allotted for a question-and-answer session. To reserve a seat, please visit my website at RepMako.com or call my district offices at 610-502-2701 or 610-760-9805. APPRISE Medicare annual open enrollment counseling will be available in my Northampton District Office, 2030 Center St., Northampton, each Tuesday through Dec. 4, except for Tuesday, Nov. 6. Appointments are available from 9:30 a.m. to 12:30 p.m. to receive direct assistance with prescription plan comparisons and enrollment. Please bring your Medicare card, other insurance cards (i.e. VA, PACE, PACENET, ACCESS) and a complete list of your medications and dosages. To schedule an appointment, please call my office at 610-502-2701.